Prakash Silwal : Kathmandu, Jan. 15 : The High-Level National Education Committee has submitted its report to Prime Minister KP Sharma Oli recommending the government for quality enhancement of community schools and ending commercialization of private schools. However, the final report of the committee is not made public yet. Chairman of the committee and Minister for Education, Science and Technology Girirajmani Pokharel submitted the recommendations with way forward for stopping commercialization in education and shifting the private schools into service-oriented ones in the future and developing community schools as the first choice of the parents. The government had formed the committee last July. 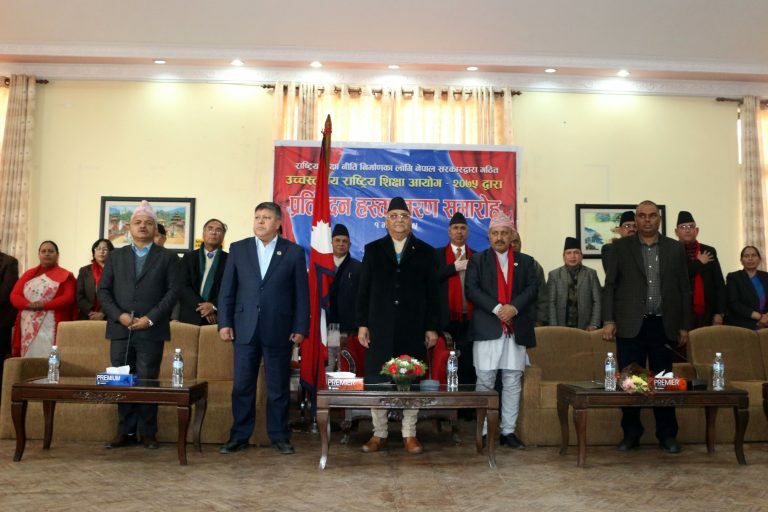 The committee has given top priority for the recovery of the community schools to ensure their characteristics in line with the socialism-oriented state system, with the Constitution of Nepal ensuring education as the fundamental right of the citizen by guaranteeing free education up to secondary level. The committee has mentioned to encourage the private schools into cooperatives, service-oriented private and social trust (Guthi), and keeping the private schools only in the service-oriented institutions in the future. However, the report has not recommended the closure of the private schools despite suggesting an end to increased privatization and commercialization of education. Receiving the report, Prime Minister Oli vowed to ensure quality education in the community schools and create an environment where the private sector itself would ‘run away’ from the education sector. “There is no need to pamper or prohibit the private sector. No parents would entertain the private schools if free and quality education was ensured in the community schools,” the PM said. For the first time in the country, such type of report for educational reform was formulated in 2011 BS while separate commissions were formed in 2018 BS, 2039 BS, 2055 BS and 2059 BS.